Our GPS tracking capabilities help make your community’s roads a safer place for commuters and fellow motorists alike. Dispatch operators can receive alerts when a bus is not in the correct geo-zone or operating erratically, allowing them to take action—including seizing control of the bus from a remote location. The costs associated with managing and maintaining public transit fleets are enormous. Our maintenance solutions help uncover innate cost efficiencies through increased vehicle availability and reliability – dramatically reducing overhead and extending the life of your fleet. One of the best ways to get people out of their cars and onto your buses is to offer a greater rider experience. Our cloud-based platform provides cost-effective and efficient solutions you can roll out amongst your entire fleet for higher customer satisfaction scores across the board. 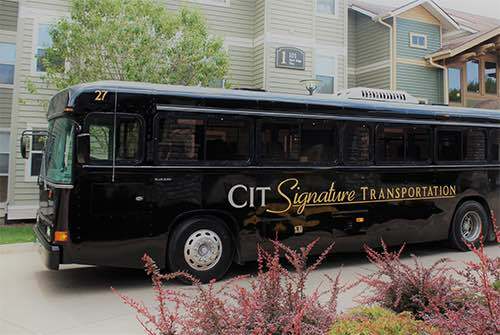 CIT provides a variety of bus transportation solutions, serving centers such as Iowa State University, University of Iowa, Regina Catholic Education Center, the Ames Convention and Visitors Bureau, CyRide and NADC Labs. Though CIT was already providing exceptional service to their customers, the company recognized the need to update their rider experience technologies and empower their passengers with the next generation in comfort and convenience systems. CIT asked us to consult on ways to update their existing fleet’s wireless capabilities and develop affordable, customized solutions that would meet their needs today and tomorrow. We developed a coordinated WiFi and GPS solution that was practically turnkey. New WiFi service provided CIT clients with dependable, broadband-speed wireless service throughout their journey, and GPS bus tracking information gave passengers up-to-the-minute details on next-bus arrival times. We also integrated fleet-health reporting technologies to improve additional operating efficiencies. Across the board, riders were delighted with the new technologies installed in the CIT fleet. Additionally, the company found significant value in the system’s reporting tools, leading to drastic improvements in vehicle and driver performance.